Now if that isn’t a heartwarming Thanksgiving sentiment, I don’ t know what is. We have learned the hard way that even the “best” parts sold at home improvement stores really aren’t contractor-grade goods. Hose bibs, for example. And PVC valves need to be ag-grade or they’re garbage. 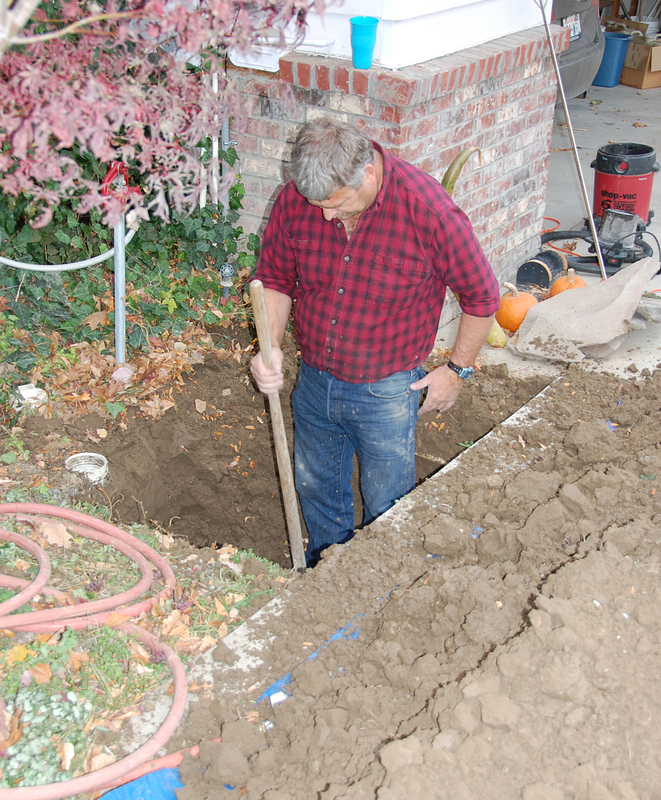 Fortunately HM found the leak and capped it off–it was stemming from the plumbing to the frost-free hydrant, which we will also be replacing. There is a reason why old people are so smart–we’ve had the “opportunity” to make a ton of mistakes. Speaking of wisdom, I now know where the 3/4″ PVC slip couplers are at the hardware store, and where to find the 735 “Fast and Wet” glue. And yes, it says that right on the label. “It’s called what kind of glue?” I asked, pen poised over my Post-It “grocery list” while HM rolled his eyes. Must be hard to have a sense of humor when you are ankle-deep in muddy water or something. As far as the baking goes, I haven’t been involved in that either. I’m not a bad cook (actually, if you need something edible whomped up fast, I’m your woman) but I don’t get much satisfaction out of the act of cooking. The worst part about cooking for me is that after I’ve put something together and smelled it cooking I usually lose all interest in EATING it. It’s a bizarre kind of food ADHD. Reminds me of playing with cats–once you let them catch the toy, they don’t want it any more. I also have a hard time smelling food cooking for long periods of time before consumption (like when a turkey’s in the oven for five hours before you eat it). I love the smell, but then I actually start to get irritated by it. And yes, I know this sounds completely neurotic (it bothers me to even admit this). I didn’t used to be this way at all, and sometimes I wonder if this has something to do with chronic pain–it’s like my nerves are on overload most of the time already. So after showering the mud off, HM came inside to make stuffing and sweet spuds. 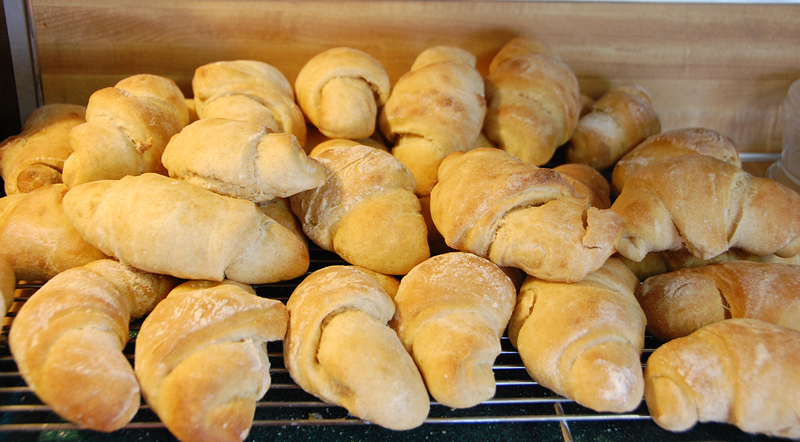 He even got up early to make the to-die-for spelt crescent rolls so we could eat them fresh this afternoon. Meanwhile, I’ve been laboring over the stacks of sweaty clothing that Things #1 and #2 are generating courtesy of basketball practice, and feeling a little guilty about not making anything to eat. But it’s all good. I’ll be delaying my arrival at the in-laws with a stop at the farm to take care of the horses. I plan to swoop in at the last minute before dinner so I can fully enjoy the heavenly food. Sound a bit rude? Maybe. But everyone knows I’ll do the dishes. Hope you had a great day! I’m the same about smelling food, if I have to be in it for most of the day, I don’t want to eat it anymore! Cooking big holiday dinners is now a joint effort in our house. I’m so glad I’m not the only one. It’s really a shame, since I love turkey. We now cook a lot of stuff outside the house for this reason. You don’t like sweet potatoes either? I’m not alone!! There are a lot of foods that I like cooking more than I like eating, too. By the time I bake the cake and make the frosting and frost the cake, I’d really rather just have a spoonful of icing and go to bed. 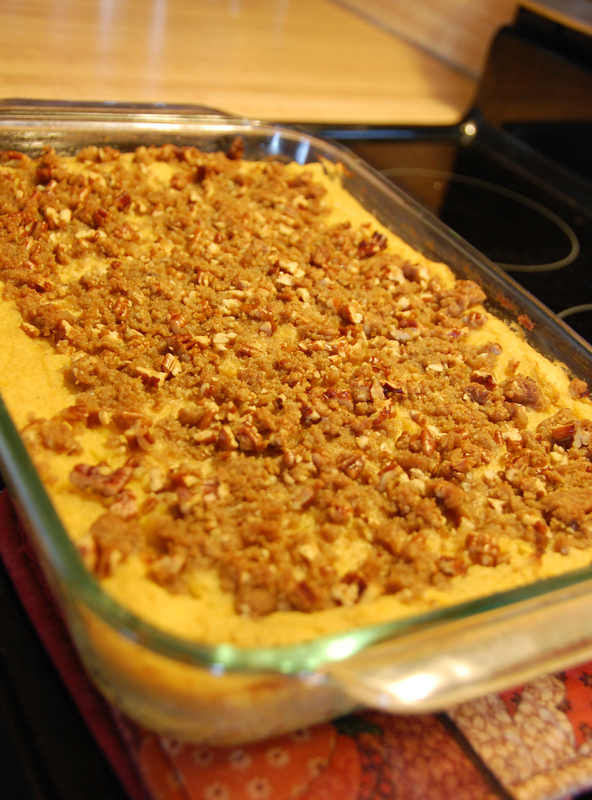 To be fair, the sweet potatoes this year were the best I’ve ever tasted–they had maple syrup in them as well as a little orange extract–but it was more like dessert than a side dish, and I prefer to save my calories for pie. I’m not in love with cooking either. I do it because if I don’t cook no one eats. Actually, I’m a great cook but could be even better if I enjoyed it. One of my daughter’s is a great cook but unfortunately she was out of town this holiday. Bummer that you had to deal with the water situation at all. Those rolls look delicious, that’s my one favorite thing at the Thanksgiving holiday meal. I’m a rolls person as well. My other favorite thing happens to be green beans and bacon (although my mom always tends to overcook em). The spelt rolls really are awesome–they also happen to be the only spelt baked good I’ve ever had that tastes good.